OK-SAFE, Inc. recently had the opportunity to interview Dr. Deborah C. Peel, founder and Chair of Patient Privacy Rights, a non-profit organization formed in 2004 to promote patient privacy and the protection of personally identifiable health information. (patientprivacyrights.org). Dr. Peel is also supporting the 2nd Annual International Summit on the Future of Health Privacy, to be held June 6-7, 2012 at the Georgetown Law Center in Washington, D.C. This summit is free, and will be available via live-streaming if you cannot travel to D.C. for this important event. Despite the laws that says employers are not supposed to discriminate based on health information – they do. Paper records did not cause health information to be leaked out – only when a third party was brought into the picture via electronic means did personal health information leak out. This electronic health information system is dangerous – not only to us, but to our children and their future. HIPPA is not about protecting your privacy – in fact, patients really don’t have any privacy rights. There are problems with “mHealth”, or mobile health, i.e. the use of Smartphones, I-pads, etc.- to view personal health information Currently, this information is not encrypted, nor is there a way to control the access to it. The Health Information Exchanges mean any party to the exchange can pull your information before you get to your provider. Although people may not have a way to opt out of all health information sharing systems, there is a Consent Form form available on the Patient Privacy Rights website, that you may like to print out and share with your health care provider to try to minimize the likelihood of your personal health information being shared. This is probably one of the most important rights issues we are facing today. OK-SAFE, Inc. – Just released is the much anticipated Final Rule on the controversial health insurance exchanges. Issued March 12, 2012 by the U.S. Dept. of Health and Human Services, these rules will dictate how the exchanges are to function, how they are to be governed, and what flexibility the state’s have if they decide to establish one. 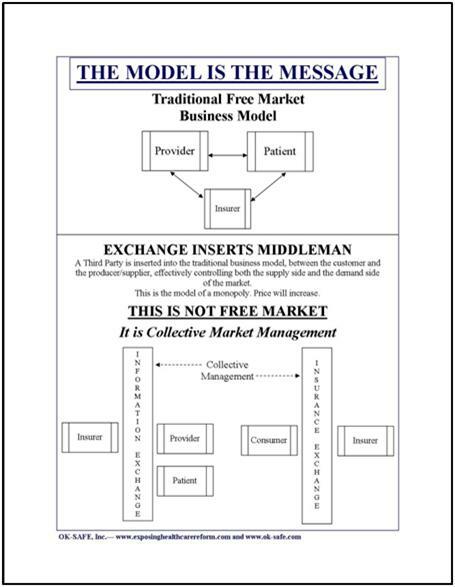 As OK-SAFE has indicated all along – it doesn’t matter if the state establishes an exchange or the the federal government establishes it, the end result will be the same: the insertion of a third party into the traditional business model to create a managed “marketplace” – a marketplace that controls both the supply side and the demand side of health care. One that links patients, providers and payers into one technological network. The model is the message. Government will determine both the health care plans available (“certified” and “qualified”), as well as the health care providers patients can use, while giving lip service to such things as choice, competition, and clout. Follow this link to read the entire HHS Final Rule. Below are two announcements on the HHS Final Rule. Health and Human Services Secretary Kathleen Sebelius today announced policies to assist states in building Affordable Insurance Exchanges. Starting in 2014, these one-stop marketplaces will allow consumers and small businesses to choose a private health insurance plan and offer the public the same kinds of insurance choices as members of Congress. The policies released today will help states in designing their Exchanges to best meet the needs of their consumers. They offer states substantial flexibility as they design a marketplace that works for their residents. Establishing a streamlined, web-based system for consumers to apply for and enroll in qualified health plans and insurance affordability programs.” Rest here. This final rule is the latest in an ongoing series of steps to help states develop Exchanges. As of February 22, 2012, 49 states and the District of Columbia have received Exchange Planning grants, while 33 states and the District of Columbia have received Exchange Establishment grants. HHS is continuing to provide technical assistance to states, including technical consultations, monthly user groups, working groups on core functions, and conferences.” Rest of announcement here. Our recommendation is unchanged – don’t build an exchange in the state of Oklahoma. Of course, SB 1629 will be hovering in the wings, ostensibly to wait for the Supreme Courts decision on the constitutionality of the individual mandate – but not on the exchanges, eh? Time to stand your ground – vote NO on SB 1629 regardless of SCOTUS decision. 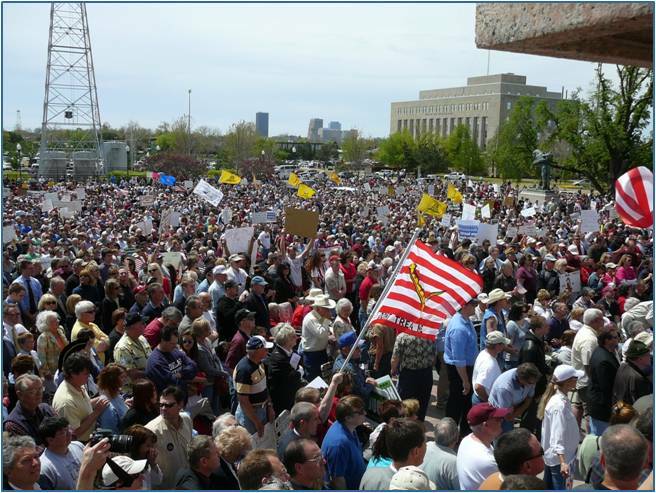 HR 1004 Discharge Petition Rally – Wednesday at the Capitol – Be There! OK-SAFE, Inc. – OK-SAFE will be joining other Oklahoma grassroots activists at 9:00 am on Wednesday, March 7, 2012 at the OK Capitol* to petition for Open Government in the Oklahoma Legislature. Wednesday’s effort is being spearheaded by Kaye Beach of Axxiom for Liberty. This citizen rally is meant to secure the remaining signatures necessary to cause HR 1004 to be discharged from committee and move directly to the House floor for debate and a vote. HR 1004, by Rep. Charles Key, simply states that if a legislator requests that his bill get a hearing in the committee it has been assigned to, the chairman of that committee must hear the bill and allow a vote. It’s that simple. As it stands now, a committee chairman, under direction of the Speaker, can prevent a bill from ever being heard in committee, effectively exerting top-down control of the legislative process. Below is an excellent post by Kaye Beach detailing the purpose of HR 1004 and instructions for Wednesday’s efforts. HR 1004 Discharge Petition-Calling All Oklahoma Activists for Representative and Open Government! By Kaye Beach, March 2, 2012. House rules allow for discharge petitions as a means to get a bill brought out of a committee for a vote on the House floor. We need the signatures of 66 House members to get HR 1004 (read HR1004) discharged from committee and on the House floor for a vote. Right now we have 45 signatures but we need a minimum of 66 signatures. That means we need 21 more signatures in order to get HR 1004 to the floor for a vote. On Wednesday March 7, 2012, grassroots activists from across Oklahoma interested in ensuring transparent and representative government throughout the entire legislative process will meet for a petition drive for HR 1004 at the Oklahoma State Capitol at 9 am. *Folks will initially meet in the first floor rotunda area for instructions, then head upstairs. The media has been invited. For the record, OK-SAFE opposes legislation that facilitates the implementation of “ObamaCare” health reform, and therefore opposes SB 1629, establishing a state-based exchange called a marketplace. Senate Bill 1629 by Pro-Tem Brian Bingman, which passed by a vote of 7-2 on Monday, would establish the very insurance exchange, or “marketplace” model called for in the PPACA, aka “ObamaCare.” Even though the Republican members of the Senate Health and Human Services committee said they oppose “ObamaCare,” not one of them voted against SB 1629, or even mentioned the actual content of the bill, which included the creation of yet another trust to oversee the exchange/marketplace. The word marketplace is alternately used to describe an exchange; the word exchange has now become too notorious to use. Curiously, Sen. Tom Adelson has submitted an amendment to the bill, nullifying it if the Supreme Court shoots down PPACA, or if a new Congress does. Most of the questions in this committee were about the “individual mandate” (not included in the bill.) A fraction of the Affordable Care is about the individual mandate; most of the rest of the bill deals with items such as the exchanges and the reconfiguration of the insurance market. The committee members either hadn’t read the bill, or they were working from talking points or a summary; they did not discuss what the bill actually says. This new trust has a twin called the Oklahoma Health Information Exchange Trust, or OHIET. Created by stealth in the last week of session in 2010, the OHIET is busy establishing the network of networks that facilitate the transfer of electronic health records everywhere. Kinda explains SB 1629 doesn’t it? Translation: they’re moving management of government-sponsored insurance from one state bureaucracy to a newly created one. Section 2 establishes the new trust – B. The Health Insurance Private Marketplace Network Trust shall be established as a state-beneficiary public trust. Translation: Oklahoma (government) is the beneficiary of the trust. Section 2 defines the trust governance: C. The Health Insurance Private Marketplace Network Trust shall be governed by a Health Insurance Private Marketplace Network Board. Translation: This section increases the power of the Executive branch due to powers of appointment; Fallin would get to appoint most of the Board members. Board members are unelected and not accountable to the public. The Secretary of Health and Human Services- (Terry Cline). F. The board of trustees shall promulgate rules as necessary to implement the provisions of the act. Translation: The appointed board will be insiders, and they can make the rules for the trust, not the legislature. Also the board members elect the Executive Director, who will likely be Dr. Cline – just as was proposed in HB 2130 the HUB bill. Section 4 is New Law authorizing trust to administer a premium assistance program for low-income individuals, and to assist small businesses (up to 250 employees for a for- profit; up to 500 employees for a not-for-profit). This was the Insure Oklahoma section, being defined for the trust. Section 5 reads in part: A. The Health Insurance Private Marketplace Network Trust is authorized to develop and implement a marketplace assistance program to assist small businesses in the offering of employer-sponsored insurance purchased from private market insurance carriers which shall go into effect January 1, 2014. Translation: The new trust is given full authority to develop and implement the exchange (oops, marketplace) in any manner they see fit. The board of trustees can make any rules they’d like to govern the funding mechanism. Nothing in this section prohibits the trust from seeking federal funding, including federal grants that are available for states to develop an exchange – one was called the Early Innovator Grant, remember? Section 6 severs Insure Oklahoma from the OHCA, and gives it to the trust. Section 7 deals with waivers. The Oklahoma Health Care Authority is hereby directed to seek any and all Federal approval necessary to implement the provisions of this act. This really shows the legislative intent. Federal approval. And Stanislawski said it would not be “ObamaCare” compliant? Want to bet?